Once you have a saved scenario as described at Recording a scenario, you may execute it as many times as desired. 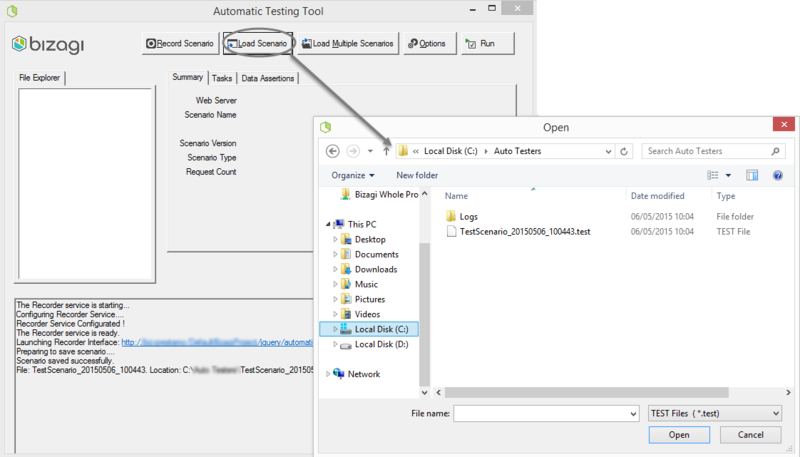 This section describes how to run a scenario while using the different parameters the Auto Testing tool offers. 1. 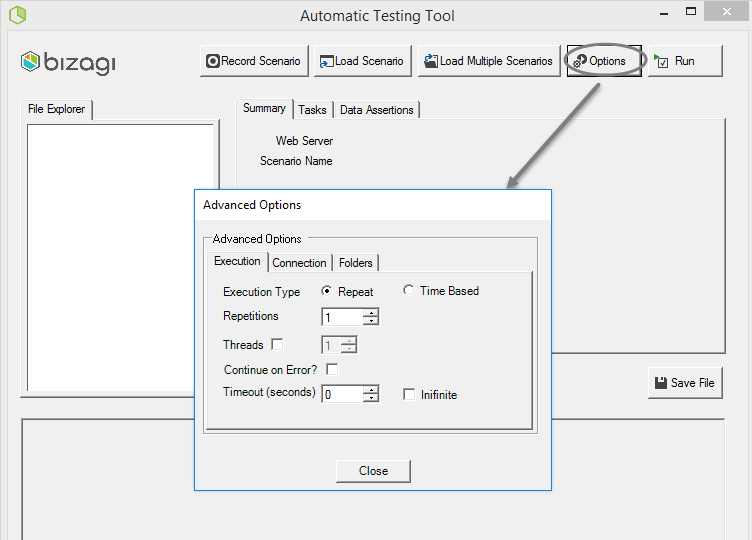 Open the Auto Testing tool and click on Load Scenario to browse for a single scenario test file you want to execute. Alternatively, you may choose to load many scenarios at once so that you can run them as a batch. In order to load up more than 1 scenario, click on Load Multiple Scenarios and select the folder on which they are all stored. 2. Notice that the name of the loaded scenario(s) appears in the File explorer and its information will show up under the summary, tasks and data assertions tabs. 3. 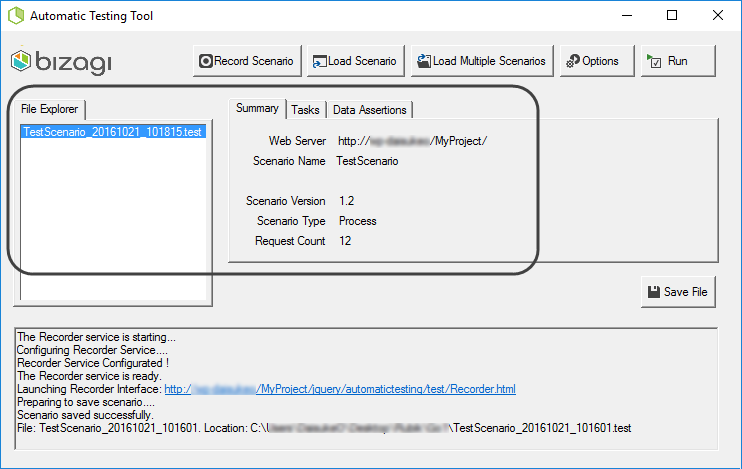 Click Options to set the parameters affecting the execution of the loaded scenario(s). Notice these options apply for the execution itself and not for any particular scenario. Edit these parameters according to the details shown in the table below. Defines how the automatic testing will produce new cases, if either for a fixed amount of time, or if a fixed number of cases are to be produced. •Repeat: Executes the scenario(s) until a certain quantity of iterations is met. •Time-based: Executes the scenario(s) during the specific period of time. This results in as many execution as those that can fit dynamically during the given time span. The number of times a scenario will be repeated. Applicable when Repeat is selected as the Execution type. 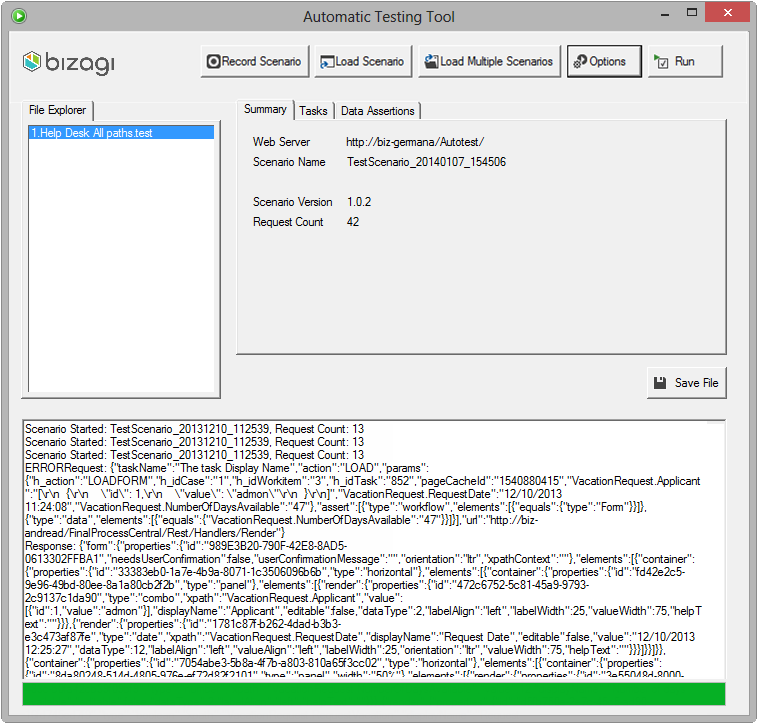 The time in minutes the automatic testing tool will be running scenarios. Applicable when Time Based is selected as the Execution type. Defines if the automatic testing should continue or not, whenever an error is found when executing scenarios in batch. When executing multiple scenarios at once, we recommend to enable this option. This way if one scenario should fail, the execution will move on to the next scenario and you may later troubleshoot the specific failing scenario. Defines the number of executions in parallel that will be launched (in different threads of your machine). For this option, consider the hardware capacity your machine has (e.g, number of cores). 4. Click close when done and finally click Run to start executing the scenario(s). Notice you may run multiple scenarios at once when having loaded multiple, by clicking on Run All scenarios. 5. You may review for a successful execution when the green bar on the bottom of the tool shows a completed status. Once you execute a set of 1 or more scenarios, you may locate its detailed log to explore results. 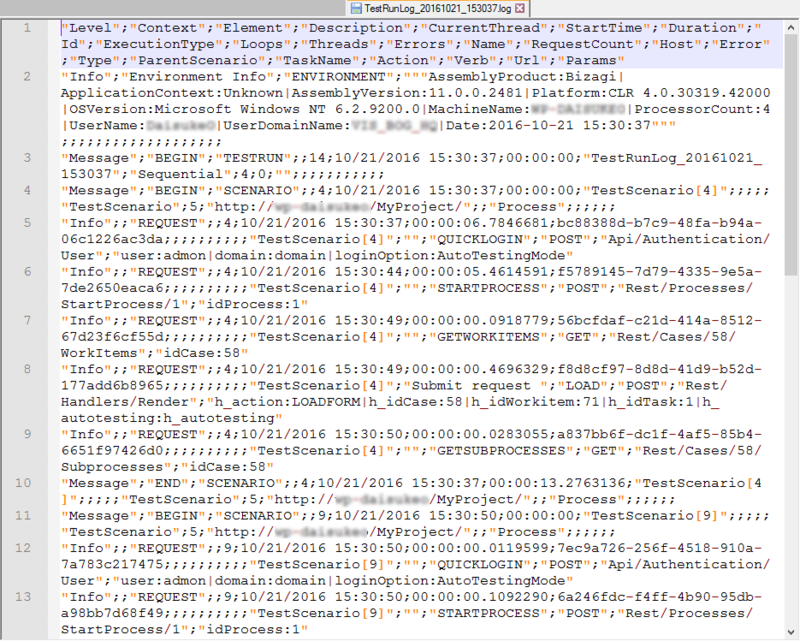 These logs are either plain text files or csv files (according to what specified in the XML configuration file in the AutoTesting.Log.Type parameter), that contain detailed information of how the execution went. Consider that [YYYYMMDD_HHmmSS] corresponds to a timestamp of the recording's timing, represented in year (YYYY), month (MM), day (DD) and time (HHmmSS). Recall that in order to view execution logs, you need to make sure that the creation of these logs is enabled. Whenever an execution is NOT successful, then the tool will display an error log as shown below. You may review which one was the last user task executed successfully within a scenario, so you can track where the process path failed. Notice the full error log will display the number of the case created, and you may also look it up in the Work Portal and verify its data and the reason why it can't be completed.